Looking for the perfect way to satisfy your sweet tooth this Thanksgiving? 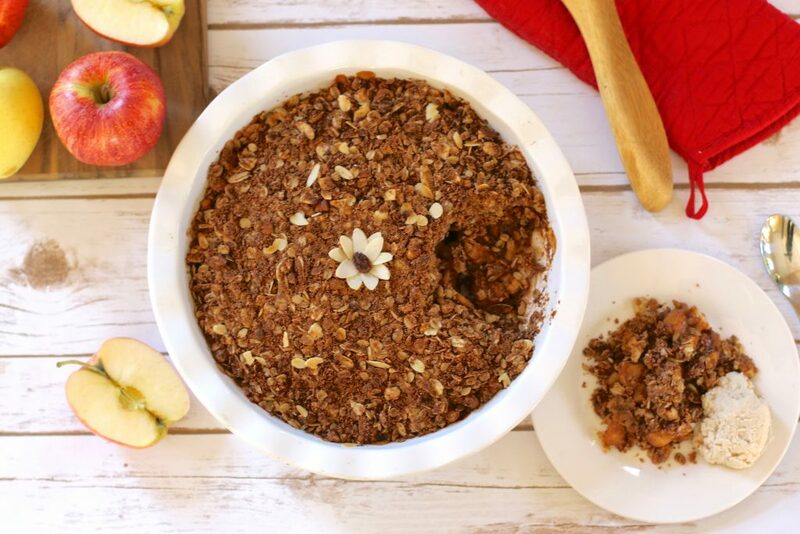 An apple crisp has long been a fall favorite this time of year. The warm, caramelized, cinnamon spiced apples combined with the crispy, nutty texture of the topping will definitely be a hit at the feast. Made also with unrefined sugar, giving this dish a thumbs up as a much healthier choice. Let’s make this post short and sweet (literally) so your table will be complete this holiday season and I can move on to the next recipe. Getting back to the madness that goes on this time of year for me is a must. You didn’t think I was going to forget the most important part of a Thanksgiving feast… the dessert! Coming from a women who loves her sweets. Before creating this recipe I did a bit of research on what makes an apple so nutritious. I stumbled upon a great site called Well-Being Secrets and the blogger wrote a post that answered all of my questions called 34 Science-Backed Health Benefits of Apples! From the history, to the numerous health benefits, and even how to buy and store apples, this post is definitely worth your time. 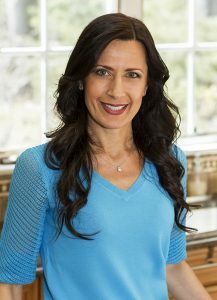 My wheels were turning and I knew I had to make my next dessert with this nutritionally packed ingredient. Well, here you have it! 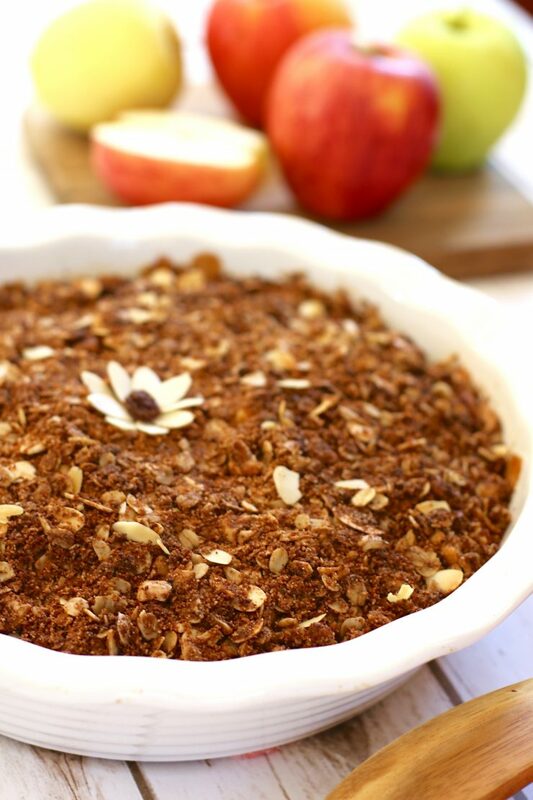 A lovely apple crisp that is sweet with a hint of spice on the inside and complimented by the crunchy, nutty texture on the outside. The dish is naturally sweetened with unrefined sugar, the bread is gf/v, and there is no butter added! 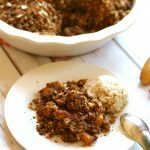 This makes it a much healthier option than any dessert out there, yet still holding true to the rich taste of a traditional apple crisp. I highly recommend giving this simple recipe a try. 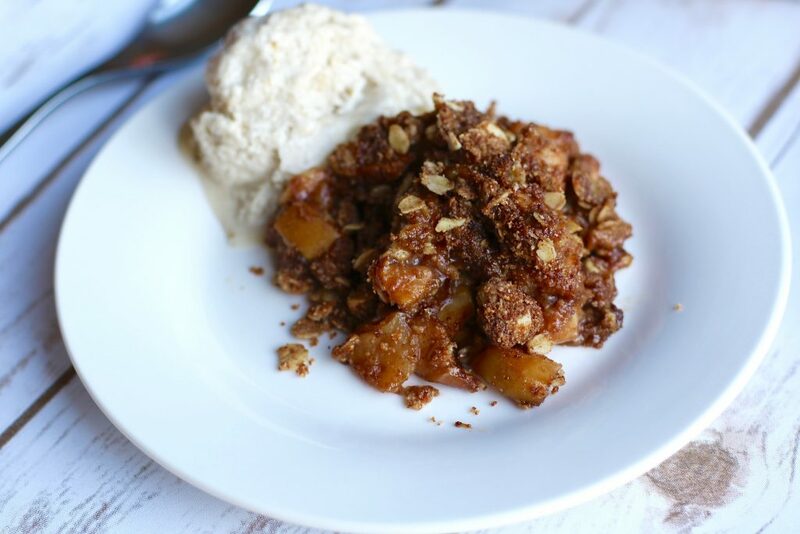 The warm, caramelized cinnamon spiced apples combined with the crunchy, nutty texture of the topping makes this dessert a perfect choice for a traditional tasting apple crisp. 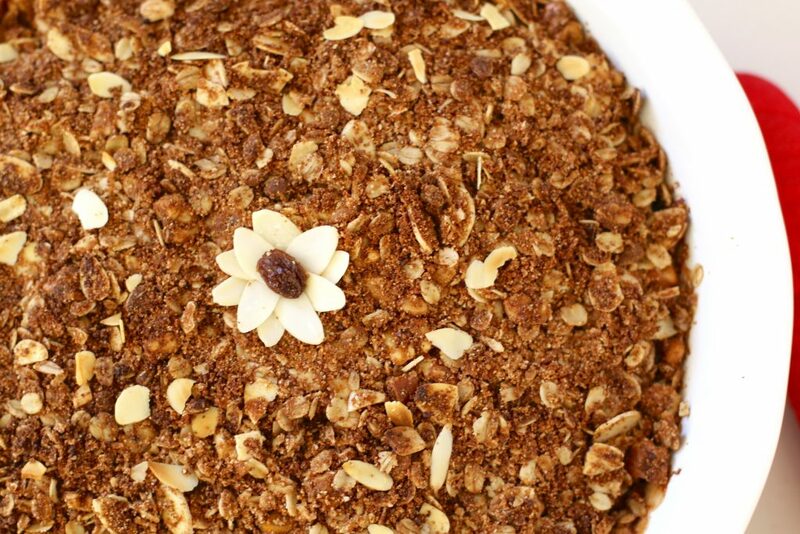 You will never guess it is GLUTEN-FREE, DAIRY-FREE, and REFINED SUGAR-FREE. Peel the apples, if desired, remove the core and cut into 1/3-inch pieces. In a large bowl combine all the filling ingredients until the apples are well coated. Transfer to a 10-inch pie dish or something similar and set aside. In a clean bowl mix together all the topping ingredients except maple syrup and coconut oil until combined. Then add the maple syrup and coconut oil and stir until it is well coated. Evenly layer the topping over the apples. Place the dish into the oven for 30 - 40 minutes allowing the apples to become tender and the topping crispy. Sprinkle the additional sliced almonds on top, let cool for 10 minutes and then serve with coconut whip cream or vegan vanilla ice cream. 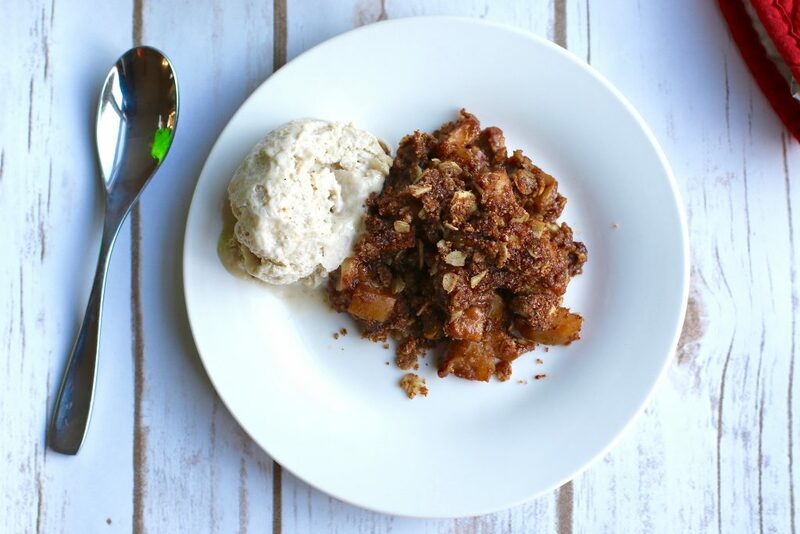 Do you like ice cream with your apple crisp? Are you making something for Thanksgiving? My kids and I tried this recipe for a post New Year treat. We loved it. It was just the right amount of sweet! I’ve shared your recipe with other family friends and recommended they try an almond milk based ice cream with it. Keep up the great work. This will absolutely satisfy my sweet tooth.